Ramadan 2014 is ending on Monday, July 28 and people are wondering when the holiday starts in 2015. The Muslim holiday is projected to begin at sunset on Wednesday, July 17 and run through Friday, July 17. Ramadan will technically start on June 18 but many Muslims begin celebrating holidays at sundown the day before the date specified for the holiday, according to Time and Date. “Regional customs or moon sightings may cause a variation of the date for Islamic holidays, which begin at sundown the day before the date specified for the holiday,” it says. Ramadan is projected to continue starting earlier in the year, so 2016 is projected to start on June 7, 2017 on May 27, and 2018 on May 16, and so forth. This is because the Islamic calendar, a lunar one that follows the cycle of the moon, moves back 10 days every year, according to the Ramadan Awareness Campaign. Ramadan can last 29 or 30 days, depending on the new moon being sighted. See an Associated Press story below. DUBAI, United Arab Emirates—Millions of Muslims across the world celebrated the first day of the Eid al-Fitr holiday Monday, which marks the end of the monthlong fast of Ramadan. The three-day-long Eid al-Fitr holiday is a time to celebrate the completion of Ramadan, a month devoted to worship and repentance during which observing Muslims abstain from food and water from sunrise to sunset every day. But the mood was dark for millions of people affected by the Syrian civil war, the Gaza war and the militant advance in Iraq. Many were just too busy trying to survive to observe the holiday. Beyond the Middle East, the few remaining Muslims in the Central African Republic’s capital city ventured out to a mosque under the watchful guard of armed peacekeepers. Others like Aminata Baryn stayed at home, still too fearful to venture out for fear of attack from Christian militias who drove thousands of Muslims from the capital this year. In the Philippines, an insurgent group attacked people traveling to celebrate with their families, killing 21, including at least six children, in the bloodiest incident by the gunmen in recent years. 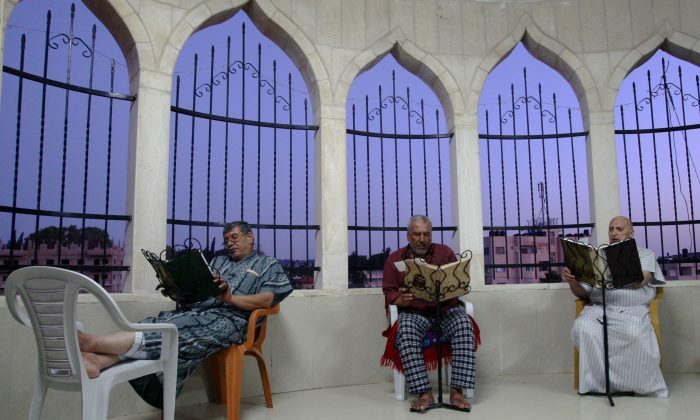 In Gaza City, streets were largely deserted, as residents huddled indoors for safety. More than 1,040 Gazans have been killed, more than 6,000 wounded and tens of thousands displaced in the last three weeks of fighting between Israel and Hamas, according to Palestinian officials. Israel has seen 43 Israeli soldiers and three civilians killed. “All we think about is to stay safe,” said Fedaa Abul Atta, a nurse and mother of six. The family was grieving the death of her nephew, killed in an airstrike. Her house among hundreds demolished by Israeli fire in the Gaza City neighborhood of Shijaiyah. The mood was equally subdued for the more than 1 million Syrian refugees in Lebanon. Despite frequent car bombings in Iraq’s capital of Baghdad, shoppers packed malls and stores ahead of Eid in anticipation of family gatherings. Muslims in Indonesia, across the Middle East, parts of Africa, Europe and the U.S. marked Eid on Monday. Millions in Morocco, India and most of Pakistan are still fasting and will likely celebrate Eid on Tuesday. That’s because Muslims use a lunar calendar and a moon-sighting methodology that can lead to the month of fasting ending on different days. In West Africa, Eid prayers were dedicated to the victims of two tragedies in the region — the crash of an Air Algerie plane that killed 118 people and an ongoing Ebola outbreak that has killed more than 670. Eid celebrations were less extravagant than usual in Malaysia as it tried to come to terms with loss of two Malaysian Airlines flights. Malaysian Prime Minister Najib Razak and his Cabinet canceled their celebrations to mourn for the victims. Similarly, Lebanese Prime Minister Tammam Salam announced that he would not be receiving guests or congratulations because of the situation in nearby Gaza. Turkish President Abdullah Gul reminded people in his Eid message that though Turkey was enjoying a peaceful holiday, many of its neighbors were not. In Qatar’s capital city of Doha, celebrations were cancelled in one area and in another the festivities were curbed back to mourn victims in Gaza. Some restaurants also had donation boxes and said they would donate their Eid profits to Gaza. Iman Eddbali, 26, said the imam leading prayers in her local mosque in Doha urged worshippers to be happy for those who cannot be happy this year.